What happens when the nation’s best five assassins – all now retired – are being hunted by their country because of the secrets they know? All hell breaks loose for this group of senior citizens deemed “R.E.D.” – Retired: Extremely Dangerous. Red stars Bruce Willis, Morgan Freeman, John Malkovich, Mary Louise Parker and Hellen Mirren. 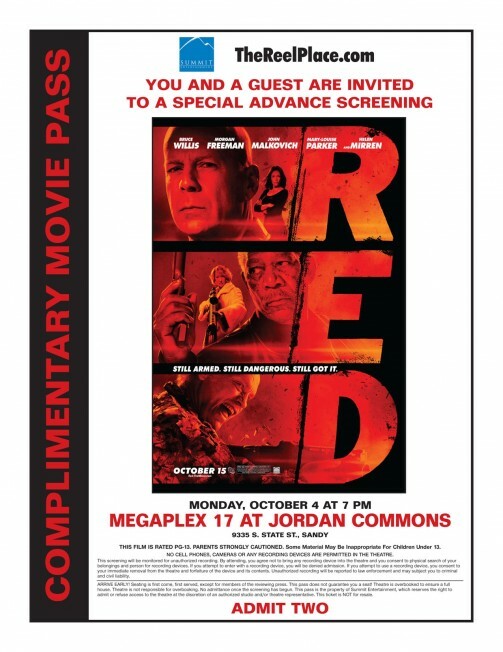 Be amongst to the first to see Red at a special free advance screening at 7PM on Monday, October 4 in Sandy, UT. To get you passes, simply click on the image below. When the pass opens in another window, print it and take it to Megaplex 17 in Sandy, UT at 4PM to exchange it for assigned seating tickets. Be sure to get there early because the screening will sell out.